Its most striking component is Swedish Punch—rummy, funky, and for decades completely unavailable in the US market. The Diki-Diki and the Doctor Cocktail are the most famous examples of drinks that include Swedish Punch, and like the Doctor, the Diki-Diki pretty much disappeared from view in the US for a generation or two; only in the last couple years has it become practical to make, with Swedish Punch’s return to the US market. The centerpiece spirit of the Diki-Diki is Calvados, Normandy’s famous apple brandy—and another product that is poorly represented in many markets. The third component is grapefruit juice, slightly lighter than lemon or lime, and a very pleasant match for the brandy base. 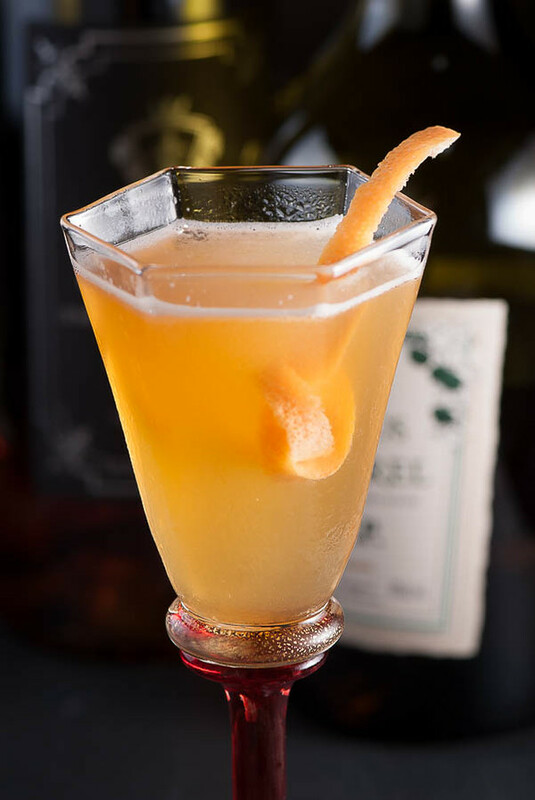 Though it can take some extra work to find the ingredients, this is a simple drink to make, and a curious and remarkable blending of flavors—the relatively sophisticated brandy, the funky punch, and the unusual choice of grapefruit to tie it all together. Diki-Diki is the chief monarch of the Island Ubian (Southern Philippines), who is now 37 years old, weighs 23 lb., and his height is 32 in. The author introduced this cocktail at the Embassy Club in London, February, 1922. I’m sure that is all true. At least the last part. Clearly, Vermiere had a sense of humor, and more important, an excellent sense of how to build an imaginative and unusual cocktail. Shake well and strain into a [chilled] cocktail glass. Vermiere served very small drinks, compared to modern styles; nearly every recipe in his Cocktails is charmingly small, sized for a 2- to 3-ounce glass. Fortunately, it’s very easy to double them up and still fit a modern cocktail glass. I’ll be the first to tell you that I don’t have broad experience with Calvados. If your marketplace is like mine, you may only find one or two labels on the shelf, and that will affect your appreciation of this drink considerably. I can say that I prefer the more aged Calvados, often marked “VS” or “VSOP,” to be a better match with the Diki-Diki than the more common, usually less expensive, “Fine” brandies, which have only a couple years aging. It seems that oak aging takes a bit of the apple edge off the brandy and provides the usual sweet and woody flavors — familiar to whiskey and cognac drinkers — that blend well with the Swedish Punch. But it doesn’t have to be Calvados. There are many other apple brandies with excellent reputations. One of the most familiar and obtainable, at least in the US, is Laird’s. Laird’s is famous for its Applejack, but it’s their apple brandy that you want for this drink—it is a better made and better tasting product, aged in charred oak barrels, American whiskey style, and makes a respectable Diki-Diki (with a name like that, can you really be respectable? ), with a rather lighter apple note than Calvados. As I noted in my article on the Doctor Cocktail, the Kronan Swedish Punsch seems to be the only product available in the US right now. You can make it yourself if you have the time: David Wondrich’s tale-filled Punch: the Delights (and Dangers) of the Flowing Bowl (2010) provides a recipe. 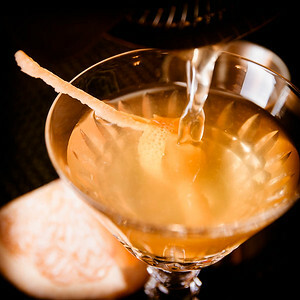 So that is the Diki-Diki: a silly name, a ludicrous back story, and a delicious and sophisticated cocktail. I guarantee that it does not taste like anything you’ve had before, but it is one you’ll come back to regularly. “Is that your real name? The Diki-Diki Cocktail” at cold-glass.com : All text and photos Copyright © 2012 Douglas M. Ford. All rights reserved. This is a delight. A very nice way to enjoy Swedish Punsch in a refreshing cocktail. As much as I love the Doctor, it’s not really what I want on a hot summer night and this fits the bill! Yes, just a bit lighter in flavor than the Doctor. And the grapefruit makes a nice change from the usual summer lemon and lime. Glad you enjoyed it.